It's been nearly a month since the committee last met to discuss complaint, opting to meet again after talks stalled. This time senators acknowledged their unbreakable stalemate, and voted 3-1 to adjourn to the call of the chair with no final decision. The state Senate Ethics Subcommittee has again deadlocked over a DFL complaint against Sen. Geoff Michel over his handling of knowledge of an affair between former Senate Majority Leader Amy Koch and caucus executive assistant Michael Brodkorb. The committee of four senators — two DFLers and two Republicans — met twice on Tuesday for more than four hours and took multiple votes on how to proceed with the complaint, each one failing on a 2-2 party line vote. It had been nearly a month since the subcommittee last met to discuss the complaint. This time senators acknowledged their unbreakable stalemate, and voted 3-1 to adjourn to the call of the chair with no final decision. DFL Sen. Sandy Pappas, who filed the complaint, says Michel lied to the press in December when he said he learned of the relationship between Koch and Brodkorb about two weeks earlier. Former Senate GOP Chief of Staff Cullen Sheehan later revealed that he told Michel about the relationship in September. Michel said he was trying to protect Sheehan as a whistleblower, but Pappas called for Michel to issue a public apology for his actions, which she claims have brought dishonor on the Senate chamber. Michel, who sat quietly for most of the hearing, said the move from DFLers is about partisan politics and retaliation, not about ethics. 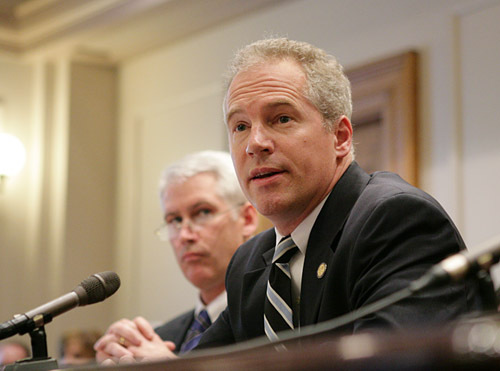 The two Republicans on the subcommittee, Ingebrigtsen and Senate President Michelle Fischbach, argued that Michel’s actions did not bring dishonor to the Senate and cautioned that revealing the information sought by DFLers could threaten the Senate’s position in an ongoing legal dispute with Brodkorb, who has promised legal action if the Senate does not reach a financial settlement with him.